This simple fork-mount design is optimized for pre-race warm-up, travel, and those days when life (or the weather) gets in the way of your ride. 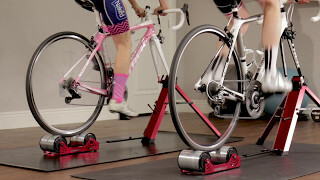 The Omnium trainer utilizes Internal Progressive Resistance (IPR), delivering a real-road feel with minimal noise. And there’s not need to buy a block to support your front wheel, as a frame fork stand is built in to the design, there’s no need for assembly it will simply unfold and fold back up when you need it to.